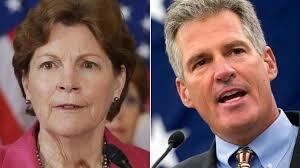 In the most recent poll from the New England College Polling Center, has Republican Scott Brown leading the incumbent Democrat Jeanne Shaheen for the US Senate seat in New Hampshire, 48.0% to 46.9%. The Brown lead is within the margin of error; however, trending into the lead in the final weeks before the November midterm elections is key. Breitbart.com discusses Brown’s hammering of Shaheen on being the same as Obama and too soft on immigration, too soft on ISIS and incompetent in their Ebola response. If the polls continue to trend toward Brown, currently Shaheen has a lead, the midterm elections could get really ugly for Democrats. Sorry, but partisan Democrat tracking polls do not count. If Democrats lose the Granite state, Senate Democrats could lose up to 8 or 9 seats in a wave election. Hey New Hampshire … What can Brown do you you? It comes after a brutal series of political bouts between Brown and Shaheen. Brown has hammered Shaheen and President Barack Obama for being too soft on immigration, creating national security and public health risks while ISIS terrorists surge into more power in the Middle East and Ebola runs rampant through Africa and has crossed into America due to Thomas Eric Duncan—the first case diagnosed in the U.S.—allegedly lying to immigration agents to get into the U.S. when asked if he had come in contact with the disease. Interestingly, this new poll shows Brown has actually picked up a point and a half with women voters since the previous New England College poll on Oct. 3. The previous poll showed Brown getting 41.9 percent of female voters—while the new poll shows Brown getting 43.1 percent among female voters. That’s significant because it suggests a series of Democratic Party and Shaheen campaign attacks on Brown in the vein of the infamous 2012 “war on women” have either fallen flat or backfired.